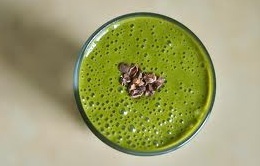 Bio Chef: Maca Mint Choc Smoothie- The Perfect Afternoon Pick-Me-Up! Maca Mint Choc Smoothie- The Perfect Afternoon Pick-Me-Up! It is for this reason I have started making this delicious new raw food smoothie to fight my mid-day boredom and junk food cravings. I found this living recipe online the other day and have been making it every day since- taking myself to smoothie heaven. YUM! 1. Add ice cubes to your Bio Chef blender or living food processor first, followed by the rest of the ingredients. 2. Blend for approximately 60 seconds depending on the power of your blender. It shouldn't completely blend the cacao nibs you want to keep a bit of a crunch. 4. Garnish on top with 1/2tbsp of cacao nibs for extra crunch and 2 mint leaves. 5. Sit. Relax. Enjoy. Allow yourself to feel distracted without guilt for 10 minutes and feel the worries of your day slip away. Why is this Living Food Smoothie Recipe So Good For You? Aside from the fact that it gives you a break from staring at your computer screen or cleaning your house or it takes you away from the stresses of your day, it is also packed with HEAPS of living food enzymes, nutrients, vitamins, antioxidants, and it just tastes amazing. The maca powder is a magic Peruvian superfood. It contains 60 micronutrients, 18 amino acids, 20 fatty acids and is high in iron, potassium, magnesium and b vitamins. Cacao, also known as theobroma cacao, which literally translates to "food of the gods", is a vital source of goodness. Cacao is one of the highest sources of Vitamin C as well as one of the highest antioxidant foods in the world. It is the highest natural form of magnesium, chromium, iron and manganese. Additionally, cacao releases the brain chemical, anandamide, which gives us that "warm-fuzzy" effect. No wonder this smoothie is so enjoyable! Mint has a very soothing effect on the mind and body. Its medicinal properties help to relieve headaches and nausea and give an overall relaxing effect. The maca mint chip smoothie is a one-way ticket to afternoon delight! With the added bonus of powerful super foods, rich vitamins and minerals. After one glass of this smoothie you will be feeling faster, stronger and ready to tackle the rest of your day.